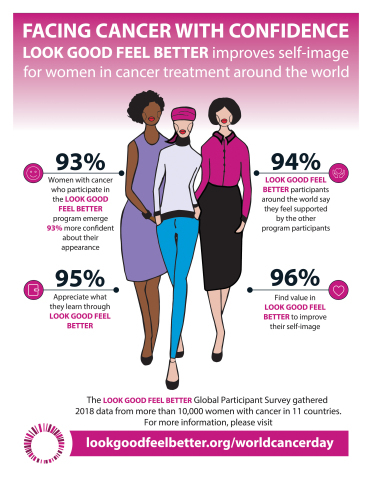 WASHINGTON--(BUSINESS WIRE)--Look Good Feel Better, the global cancer support program, today announced the results of its 2018 global participant survey, which reveals the extent of the groundbreaking program’s impact on self-image. Across 11 countries on five continents reporting results, Look Good Feel Better reported that women who participate in the program emerge 93% more confident about their appearance. Fewer than half of survey participants reported feeling very or somewhat confident in their appearance before attending a workshop. That increased to 93 percent following workshop participation. 95 percent of respondents appreciated what they learned, and 96 percent found value in the program to improve self-image. 94 percent of respondents around the world indicated that they felt supported by the other program participants.